I had tried to rally my spirits. I knew I was blessed to have held Matilda in my arms for this long. But fear continued to paralyze my hope. It was a struggle that I faced moment by moment. The night leading into Matilda's one month birthday was long and full of trials. Our night nurse was fine, we had had her before, and she always got the job done. But she was not very personal, in fact, she seemed unnecessarily nervous. We liked to keep our eye on Matilda, not because we didn't trust the hospital, but because we felt it was important to be involved and aware of what Matilda was going through. Perhaps she was not used to parents staying up, asking questions, and eagerly wanting to help. Whatever it was, I was glad that Tyler had decided to stay. Around 11pm Matilda was receiving blood products which always caused her blood sugar to tank. This was because a delicate dance had to be performed with her IV lines due to the lack of access. We had decided to try and taper down her IV nutrition (TPN) before switching over to the plasma (FFP), so that her body would have time to adjust. But during one of these switches, the TPN was not turned back on. 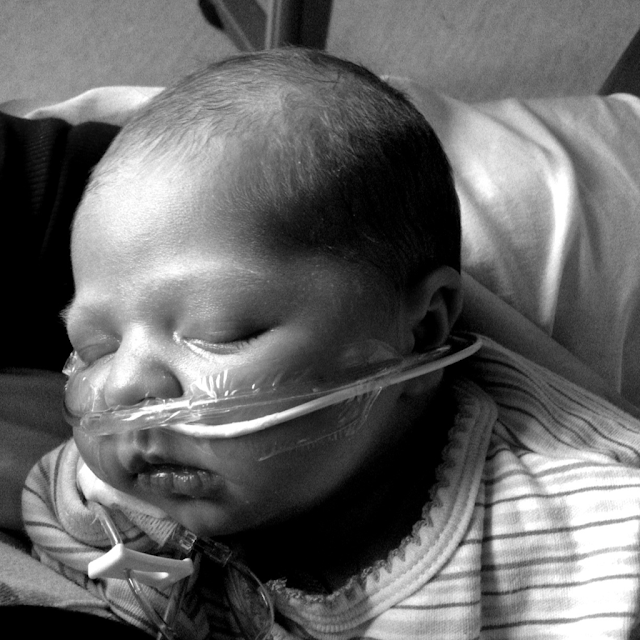 It was Tyler who kept an eye on Matilda's vital signs and her IV pumps. It was Tyler who let them know things were not right. With the TPN turned back on and the FFP being given through the expired line in her leg, we made the plan to push for a new solution in the morning. Unfortunately, the night got progressively worse. Matilda continued to throw up every few hours. This lead to x-ray after x-ray, checking this and that. Matilda looked miserable, exhausted, and her ammonia levels kept on increasing. And on top of all of that, the thing that scared me the most was that she was seeming less and less affected by the high levels of toxins in her system. Perhaps I should not have felt scared. Perhaps she was trying to tell me that she was strong. Perhaps I should have had more faith. As night rolled into morning, I kissed Matilda on the head, held her hand, and promised her that today we would celebrate. Because you only turn one month old once, and we were going to make it count.